The British artist Simon Starling refers to objects or individuals in his projects, which embody the possibilities and ideas of Modernism. Based on extensive research, he elucidates the meaning of the vocabulary of Modernism, as well as the structures, on which this myth is based. By transforming auratically charged objects, reconstructing them or transferring them to different contexts and materials, he questions their original intentions and conditions. In this, unlike the avant-garde that focused on a break with history, his new definitions stress the continuation of history and its variations. In the installation Inverted Retrograde Theme, which creates a space within the main room of the Secession, Simon Starling reflects on the ideas of twelve-tone music developed by the composer Arnold Schönberg, born in 1874 in Vienna. 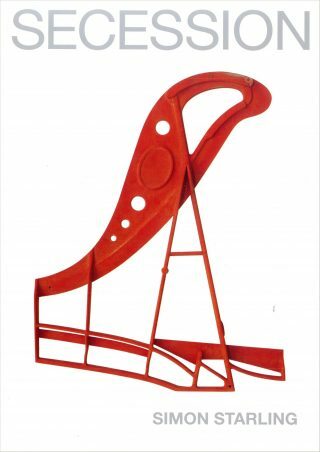 As in previous projects in Berlin with Otto Lillienthal and in Ljubljana with Joze Plecnik, Simon Starling has chosen Arnold Schönberg as one of the outstanding pioneers of Modernism as the starting point for his artistic exploration. 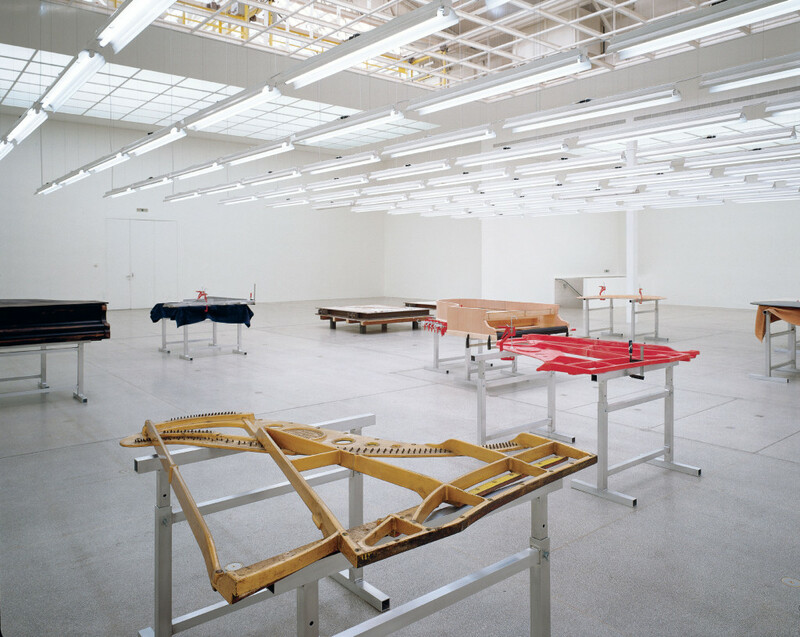 In Inverted Retrograde Theme, the structure of Arnold Schönberg’s twelve-tone music is related to the modernist architecture of the exhibition space and the way in which a piano is constructed. 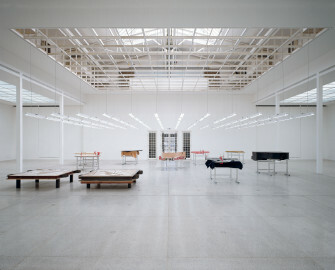 Aspects of mirroring, inversion and translocation, which are characteristic for twelve-tone music, are transferred to the installation to spark a new, contemporary view of modernism and its inherent visionary potential. 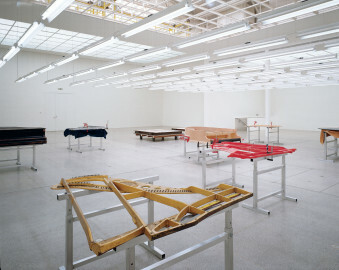 Twelve rows of neon tubes, one disassembled grand piano and one whole one are the functional components of this work. 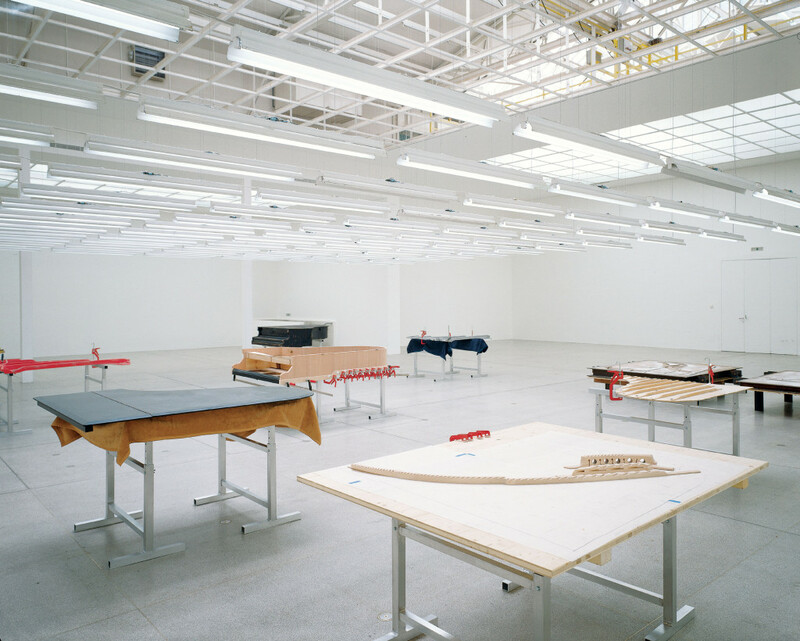 The fluorescent lights that are normally part of the central ceiling construction of the Main Room of the Secession, are dismounted and lowered into the room below. Onto these relocated neon tubes is transcribed a simple Schönberg’ian twelve-tone composition—a kind of visual score—controlled by time switches, the tubes flicker in four different constellations across the space. This newly defined space created with the lighting system has the rough character of a production workshop and contradicts the white cube of the exhibition space. There are two 19th century grand pianos in the improvised workshop, one of which Starling has taken apart and then rebuilt in reverse. 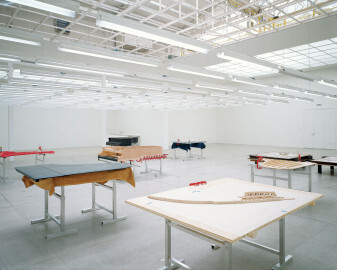 All of its newly altered components are ranged out across the space. A new inverted rough-cast copy of the piano’s cast-iron frame is there, with the two halves of the casting box that was used to form it. Along with these are the corresponding inverted piano body, wooden sound board and piano lid. In combination, a vision of grand piano constructed in mirror image may be recognized, the high notes becoming the low notes and vice versa. 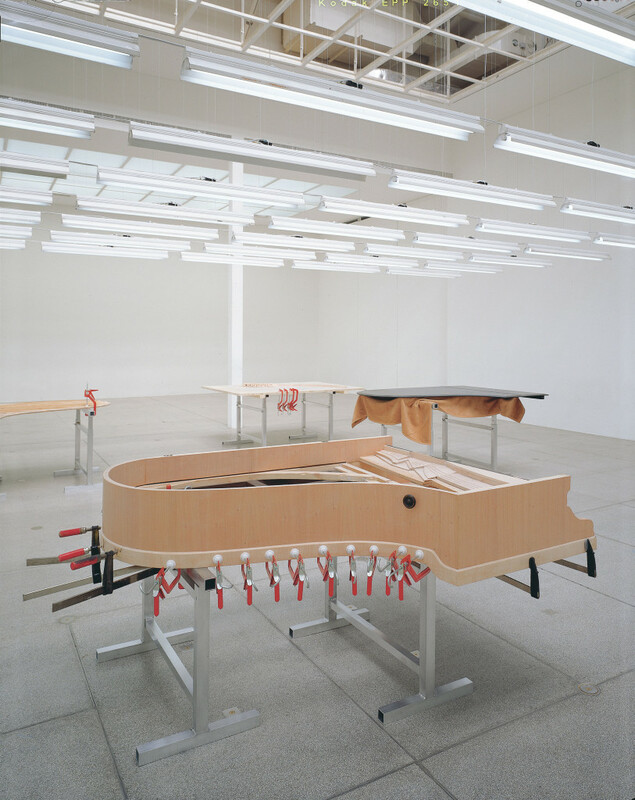 In this way, Simon Starling transfers the stringent organizational system of twelve-tone music to the architecture of the piano, forcing a radical musical structure to collide with a traditional instrument. Playing with contextual shifts also characterizes Starling’s project Rescued Rhododendrons, in which a historical development is reversed, and which Simon Starling shows as a video installation in the gallery of the Secession. The video work deals with returning the plant Rhododendron ponticum to its original site. Imported from the south of Spain to the north of Scotland in the mid-18th century, it is considered a weed there today. In the course of an announcement for a sculpture project in the Scottish landscape, Simon Starling learned that the rhododendrons were to be uprooted and destroyed, so that they would not alter the original heathland ecosystem. Starling counteracted this plan and set out with the plants—in a red Volvo 240 Estate as transportation—on a rescue mission to return them to their original homeland. 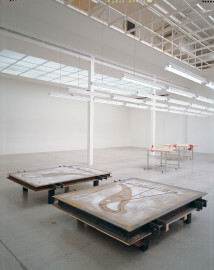 Simon Starling, born in Epsom, England, in 1967.